Smoke from California wildfires fills the sky as air quality worsens. Infamous for its sunny days and sandy beaches, the Golden State is gaining a new meaning, as fire rages through both its northern and southern ends. With Camp Fire blazing in the north and the Woolsey Fire burning through the south, the entire state is crippled by tragedy and debilitating air quality. According to the Environmental Protection Agency’s Air Quality Index (AQI), Tuesday was measured at 152, which is ‘unhealthy.’ As a result, the EPA issued a health message advising people with heart disease, older adults, and children to avoid exertion. Due to their highly destructive nature, many are worried about their safety and puzzled as to how these wildfires were caused. Wildfires are blazes that are controlled by different types of weather, dry underbrush, and wind, which burn land by the acres and take over everything in their paths, in just a few minutes, according to Conserve Energy Future. 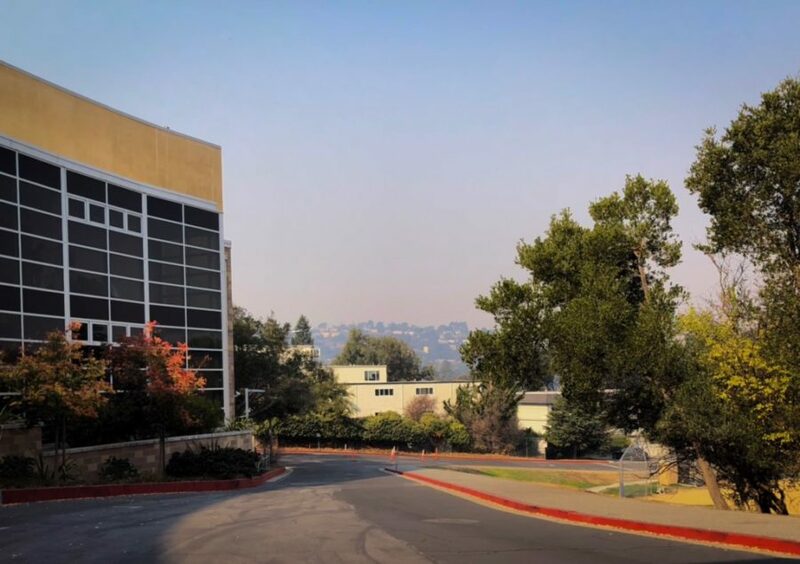 Schools throughout the state have issued days off due to the unhealthy quality of the air, as it poses a threat to those with lung conditions such as asthma. These dangerous levels represented on the AQI have also resulted in the cancellation of 16 total playoff football games, as the North Coast Section game schedule indicates. This impediment to daily life leaves many wanting to help, but uncertain how to do so. Local, regional, state, and even national organizations are implementing systems to provide relief for victims. They encourage donations to help the victims of the fires, repair the torched homes, and supporting first responders. As the Woolsey Fire burns through Ventura County, celebrity homes are some of the first to fall. One of the many victims is singer and actress Miley Cyrus. The “Hannah Montana” star tweeted out to her 40.4 million followers expressing her devastation surrounding the destruction of her Malibu home but is relieved that everyone, including her pets, was evacuated and physically unharmed. Amidst the tragedy, Cyrus and other celebrities such as Caitlyn Jenner and Robin Thicke have taken to their social media platforms encouraging their fans to donate to various organizations. In an emotional tweet, Cyrus expressed her sadness and hope for the Ventura County community. “My house no longer stands but the memories shared with family & friends stand strong,” said Cyrus.